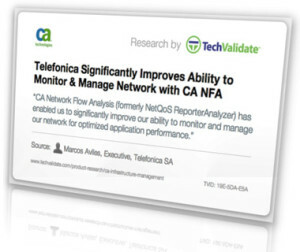 CA Network Flow Analysis is designed to track 100 percent of all network traffic to provide you with an enterprise-wide view of your flow data. This visibility can help your organization make network performance decisions with all the data—not just a subset. By understanding who, what, where and how network traffic is flowing, you can proactively manage your network to reduce outages and ensure efficient operations, change the way you manage your network infrastructure and change management’s perception of the resource. CA Network Flow Analysis is designed to easily scale to support the volume of data on the world’s largest networks. By harvesting a rich set of traffic statistics, it provides real-time visibility and behavior analysis of network traffic. This network flow tool is designed to utilize the data collection capabilities of your existing infrastructure by leveraging traffic statistics collected from Cisco IOS® NetFlow and the industry standard IP Flow Information Export (IPFIX)-enabled routers and switches. With CA Network Flow Analysis, the industry’s premiere network flow analyzer tool, you can right-size WAN circuits across your infrastructure, taking into account the offices they serve and the applications running on them. You can help ensure adequate bandwidth and eliminate excess, expensive bandwidth. You can also determine the bandwidth consumption of a particular application and calculate the cost of running that application in the cloud to evaluate whether provisioning the application in a cloud environment is more economical than in your company’s data center. Flow forensics: CA Network Flow Analysis is designed to track 100 percent of all flow traffic on the network. Gain visibility into networks, providing applications, hosts, conversations and QoS information about the network traffic, so you’ll know what users and systems are accessing what protocols and applications, in what volume, on what links, anywhere on your network. Long-term data capture: This network flow analyzer helps you retain and access over a year of enterprise-wide flow data with no data roll-ups. Designed to report on 100 percent of network flow traffic for the entire network for 30 days, it can scale to support the volume of data on the world’s largest networks. Anomaly detection and network flow analysis alerts: CA Network Flow Analysis offers automatic alerting of abnormal network traffic and events. It also provides early warning of malware, tunneling, rogue user behavior, host misconfiguration, applications exceeding bandwidth capacity and other performance threats. Intelligent network flow analysis and reporting: Customizable calculations for capacity planning, including trending based on application, location, and bandwidth, help ensure accurate decisions are made regarding cost reduction and capacity planning. Analyze trends in applications, hosts, and conversations per QoS policy. Determine appropriate application classification and validate QoS configuration changes made to the network. Broad integration with other CA products and third-party tools: No single data source is sufficient to manage today’s complex enterprise network. Recognize potential security events and issues. Make more informed, reality-based infrastructure investments. Optimize network infrastructure for application performance.